Now offering the parts to build rail beds. These are liner and metal fence rail construction to avoid the problems associated with lumber and termites in certain places. Assembly Manual and e-mail support provided. The rail bed rig is 4′ wide and about 8′ long. There is a 4′ by 4′ bed in the upper section which I usually use as a media bed (media not included.) And then the lower section which totals about 8′ long has a section under the upper bed and a 4′ section that juts out in front that can be used for pond plants or as a raft bed. The entire lower section also acts as the sump. 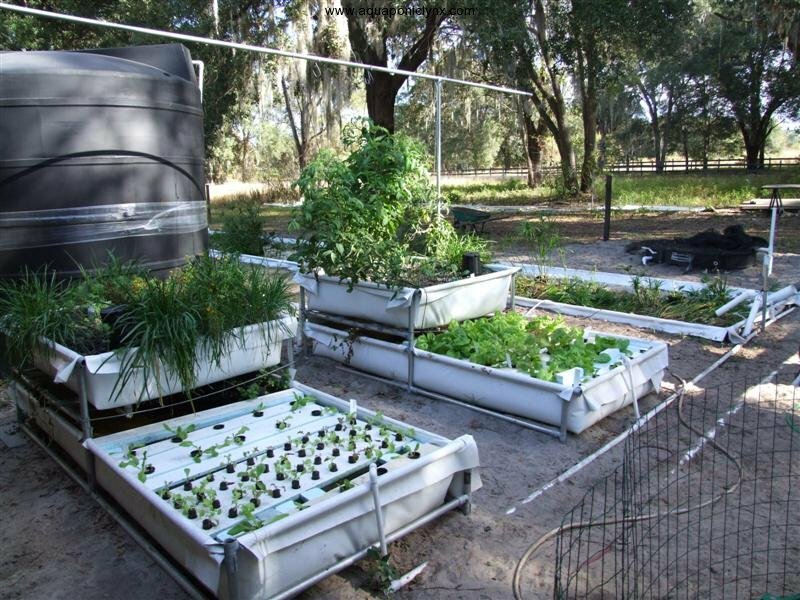 These rigs are designed to be used with a separate fish tank though they could be used for Hydroponics without the addition of a fish tank. Water pumps, air pumps and plumbing sold separately since almost every layout will be different and I hate to put together a package that always has to be taken apart and re-worked. The complete rail bed rig is available for local pickup only, I am not interested in spending time and effort getting endless freight quotes to ship this only to have everyone decide it costs to much to ship it and they will get the fence panel and metal pipes locally. I will put together a liner and clamp kit for those who wish to get the fence panel and rails on their own. If you are in central FL and REALLY want one but can’t arrange to pick it up yourself or have a friend pick it up for you, I may be able to deliver and set it up for you for a fee (the fee will be based on mileage and time from my farm to your place and back to my farm. I am interested in taking a closer look at your Basic Rail Bed system. How far are you from Destin? Looks like Destin is up in the panhandle and from a quick glance it is over a 6 hour drive from Yalaha. I believe Atlanta is around 8 hours from here. I don’t have any complete rail bed systems on hand to sell at the moment. I do have my quarantine system running which has two basic rail bed rigs hooked to it plus a sump, fish tank, pump and assorted other plumbing. The rail bed rig which is just the media bed with the sump/raft space below I have the demo rig on hand but I do not have the rest of the “system” on hand to sell. The rest of the system would be things like the pump, fish tank, air pump, air stones, media, plumbing etc. I also now sell Raft Master kits which are a raft bed frame system that can be shipped. They are easy to set up as long as you have a flat level sturdy place to build them. If you are still interested in a farm tour, let me know so we can arrange it. I usually do farm tours bu appointment for $60 an hour. But right now is not really the best season to see a farm here in Central Florida as it is the end of the “down” season for most of my crops.